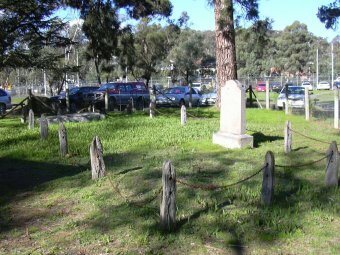 Situated next to the Hurstbridge Preschool on Greysharps Road, Hurstbridge is the old Hurst Family Burial Ground/Cemetery. It is located just north west of the Hurstbridge Railway Station on the right hand side of the entrance to the Recreational reserve. The burial site containing two headstones is fenced with one side bordering the pre-school. There is a gate, currently locked, in the front of the cemetery. Access can be gained via the pre-school after seeking permission. 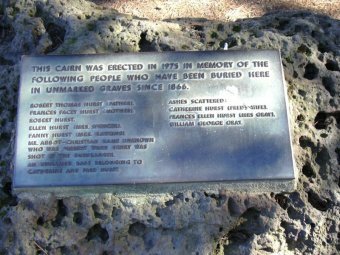 Outside of the burial ground is a plaque attached to a rock cairn providing information on the burials in the family cemetery. 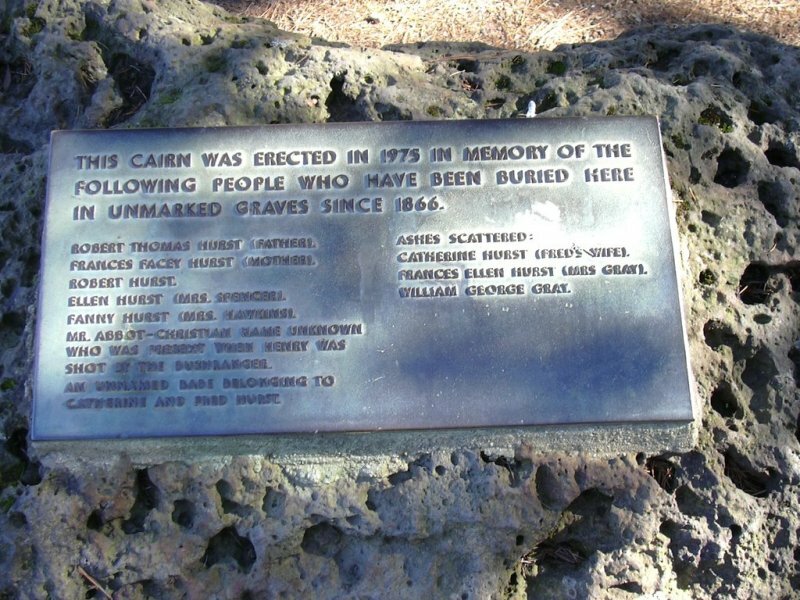 The land containing the cemetery was purchased by the then Eltham Shire Council in the 1970s from Mrs Sheila Ferguson who is a great niece of the Hurst family. The plaque in front of the cemetery records the following interments in the cemetery; seven burials and three sets of ashes scattered. present when Henry was shot by a bushranger. Research has identified that the unnamed babe of Fred and Catherine Hurst was probably Mary Catherine Hurst who died at age, 5 days, on the 7 October, 1875. 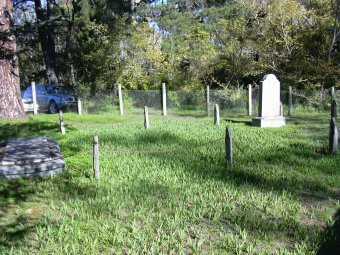 * Diamond Creek Station, Private Cemetery. There is a heritage overlay on the cemetery in place taken out by the old Eltham Shire Council. In 1841 Cornelius Sharp Haley took up the "Allwood" run from the government. Henry Facey Hurst, who was a surveyor, came to Victoria from England in 1852 and in 1859 he moved to "Allwood" to manage 160 acres for Haley. About 1865 Henry's parents Robert and Frances Hurst and their seven children joined Henry at "Allwood". In the 1860s Henry Hurst built a log bridge over Diamond Creek and it is believed that from this bridge crossing that Hurstbridge got its name. Hurstbridge is about 26 km north-east of Melbourne. Its name was formerly Hursts's Bridge named after Henry Hurst the early settler who was shot and killed by the bushranger, Robert Bourke, on the 4 October, 1866. Bourke had called into the property and while there he shot Henry Hurst. Bourke was captured, found guilty of murder, and hanged. The death certificate for Henry Facey Hurst noted him as a squatter, 34 years of age and buried on the 8 October, 1866 at Diamond Creek Station Private Cemetery. He was the first burial in the family cemetery. Of interest is that there are two death certificates for Henry. Robert Hurst, father of Henry, aged 67 years, died on the 1 April, 1873 and was buried at Alwood Cemetery on the 4 April, 1873. Frances Hurst, aged 73 years was buried on the 26 December, 1880 at Alwood Cemetery. The last burial was in 1927. The cemetery is now closed for further burials. There was an article in The Age newspaper on the 10 February, 1975 headed "Pre-schoolers will play in old graveyard", about the old cemetery. * Frederick George Hurst who died aged 86 years on the 9 June, 1927. (He was the last burial in the cemetery). This is flat gravestone. * Henry Facey Hurst of Dorset, shot on the 4 October, 1866, aged 34 years. 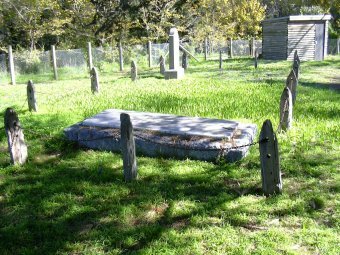 The shire council is responsible for the care and upkeep of the cemetery. Earlier on it had been neglected and overgrown. Of interest is that there is supposed to be other burials in the Hurstbridge area, probably lone graves. It would be great if any information on these could be identified. Any further assistance would be greatly appreciated.